Oxygen therapy is popularly used for treating numerous types of respiratory diseases due to its beneficial palliative and supplementary role. Globally, Development of efficient and advance technology and Rapidly ageing population with increasing risk of developing respiratory diseases are the prime growth drivers of global Oxygen therapy devices market. In addition, emerging economies such as China, India and others, will create new opportunities for global Oxygen Therapy Devices market. However, higher cost of the research and development and occupational hazards is the key restraints for global Oxygen Therapy Devices market. North America held substantial revenue share of the overall oxygen therapy market The increasing number of product approvals and high R&D investments are the key growth drivers responsible for the largest share of the market in this region. It is followed by Europe in terms of revenue share owing to the presence of favourable government initiatives for improving respiratory care, such as European Committee for Hyperbaric Medicine (ECHM). This report identifies the Oxygen Therapy Devices market size in for the year 2016-2021, and forecast of the same for year 2021. 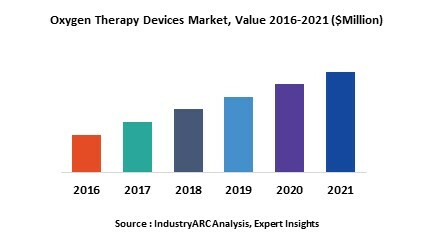 It also highlights the potential growth opportunities in the coming years, while also reviewing the market drivers, restraints, growth indicators, challenges, market dynamics, competitive landscape, and other key aspects with respect to Oxygen Therapy Devices market.